This Quick Start describes the basics for communicating by using Microsoft® Lync™ Online communications software. It explains how to use Lync Online to easily interact and collaborate with the people at your workplace. If you’re already logged on to your organization’s network, sign in by starting Lync. Click Start, click All Programs, click Microsoft Lync, and then click Microsoft Lync Online. When the Lync main window opens, if you see your name and your presence status, you’re signed in. 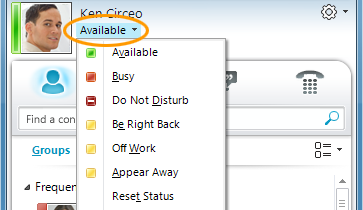 Click the availability menu, and then click your presence status, or click Reset Status to let Lync set it automatically, based on your activity and Microsoft® Outlook® Calendar. The following table describes each of the presence status indicators. You are online and available to be contacted. You are in a Lync call, or, according to your Outlook Calendar, you are in a meeting, and don’t want to be interrupted. You don’t want to be disturbed and will see conversation alerts only if they are sent by your Workgroup contacts. You are stepping away from the computer for a few moments. Your computer has been idle for a period of time (15 minutes by default). You are not working and are not available to contact. You are not signed in. You’ll appear Offline to individuals whom you have blocked from seeing your presence. Your presence is not known. Your presence might appear unknown to others who are not using Lync as their instant messaging (IM) program. You can personalize your location, phone numbers, and presence information. For example, you can add your mobile phone number and make it available only to close contacts. To set a location to let people know where you are today, in the location menu, click Show Others My Location. To add a phone number to your contact card, click the Options button , and then click Phones. Click the button for the phone number that you want to add (such as Work Phone or Mobile Phone). In the Edit Phone Number dialog box, type the number, and then click OK.
To change privacy relationships for the people you want to see personal phone numbers, right-click the contact’s name in your Contacts list, click Change Privacy Relationship, and then click Friends and Family. Under Display photo, clear the Show photos of contacts check box to hide other people’s pictures, and then click OK. Note: The file must be less than 30 KB in size. 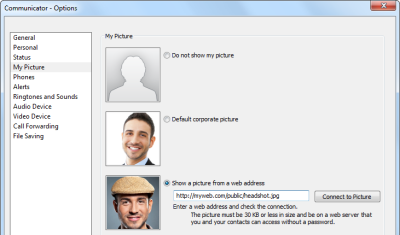 If the photo that you want is larger than 30 KB, see Prepare a picture for Lync Online. Point to a person’s picture. When the contact card opens, click the IM button. Point to a group in your Contacts list, and, when the group contact card appears, click the IM button to send a message to the whole group. 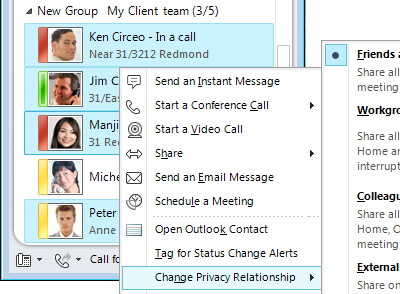 In the Lync main window, drag a contact name from the Contacts list, and drop it onto the conversation window. To add contacts outside of your organization (whom you can’t IM) to the conversation by e-mail, in the conversation window, click the People Options menu, and then click Invite by Email. To join, just click a link in the email message (outside users can join the conversation regardless of whether they have Lync installed).